Auxilry - Dynamic Interchangeable Shirt Accessories 2.0! FAQ: Auxilry - Dynamic Interchangeable Shirt Accessories 2.0! How many ways can I style my garments with Auxilry interchangeable buttons? Here are a few basic formal ways to accessorize with Auxilry for any occasion, but ultimately you can be creative as you'd like to. You can use them on woven and knit garments. Photos and stye techniques will also be shared on the www.auxilry.com site. Add a pair to regular shirts on "cuffs only" to get a cufflink look. Add a pair to "button down collars only". Add one button to your "top collar only" for and accent. Add them to your entire shirt. Decorate and create unique touches on jackets, bags, lapels, sleeves and other accessories. Is Auxilry sustainable or environmentally friendly? The button and fastener material themselves are made with medical grade ABS polymer and brass materials currently the only thing strong enough to endure common and industrial washing uses. Both ABS and Brass are 100% recyclable and sustainable. The process of making the product itself is standard to button making and utilizes every bit of material waste as possible. They are made in a factory that has passed and is registered with Code of Conduct Compliance. 100% of the packaging is also recyclable in 2 ways - 1. to reuse and save for storing additional buttons 2. simply discarding into recycling. For additional sustainability of resources, the interchangeability of buttons itself will help people purchase less garments in general allowing them to give new looks to old garments reusing the same garment more often and saving money in the process. If for any reason any part is defective or becomes damaged, a replacement will be shipped to you at no charge (with the exception of shipping, and for these small parts is not much). What is a Premium Charter Club (PCC) Member? Early supporters of Auxilry will become PCC members. Your prices and discount rates will be lockedin for infinity and you will have first access to exclusive deals, news and the design process. Can I interchange or reuse the fasteners? This is a Yes/No answer. Auxilry fasteners once applied are super strong and do not fall off. However with the use of a tool such as nail clipper you can firmly clip off the pronged portion of the fastener thus making the prongs un-useable leaving you with a fastener base portion that can be re-used. NO! Antiquated button covers are a thing of the past. They are bulky, larger than your existing buttons, therefore making them impossible to button and un-button (so you have to take them on and off every time you want to open a shirt) damaging the thread as well! Auxilry interchangeable buttons are the exact size of standard buttons and you can leave them on, or interchange them as you please. The feel and act as normal buttons without the hassle of thread but with the super power of interchangeable faces. Can I use Auxilry interchangeable buttons if I am visually impaired? Auxilry makes it so much easier for the elderly and the visually impaired to apply a button. No more needle and thread or knowing how to sew. Applying a button is a "snap" literally! Anyone can do it in seconds! Are Auxilry interchangeable buttons only for men or women? Auxilry is currently unisex. As the collections expand I will be adding more mens and women's specific button styles. Are Auxilry interchangeable buttons a patented product? Auxilry has been filed under the Patent Cooperation Treaty (PCT) with US and other international patents pending. Will you create larger sizes for suits and jackets? Eventually and it is planned for another campaign coming shortly after fulfillment of this initial campaign. However for the initial offering I am starting with shirt sized buttons and build from this. Will I get to choose the interchangeable button styles and fasteners of my choice? Certainly! At the end of the campaign, I will send out a Kickstarter service that will give you the options for choosing styles. 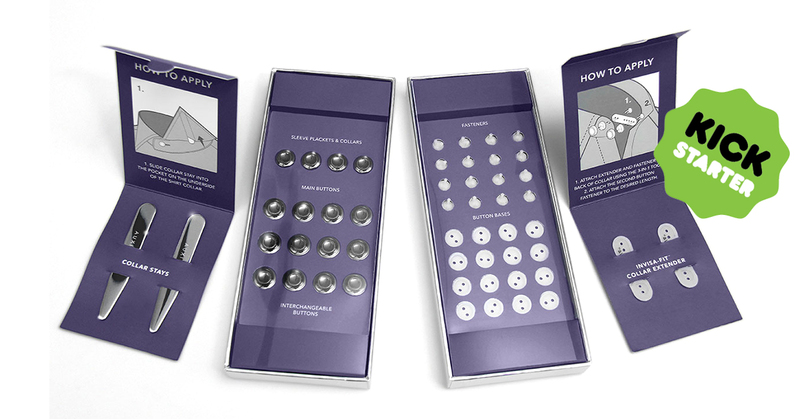 Are the Auxilry fasteners and interchangeable buttons machine washable and dry-cleanable? Absolutely! The Auxilry fasteners are made with medical grade polymer that withstands much higher temperatures than industrial dry-cleaning and machine washing. You do not have to remove the interchangeable buttons either. You can simply wash everything as is. Auxilry has been rigorously tested in over 80+ tests involving dry-cleaning, machine washing and ironing. Can I customize my order and add additional product to my reward tiers? $6.00 per fastener/base pack $10.00 per interchangeable buttons $2.00 per set of premium collar stays $2.00 per set of collar extenders Then send me a note or request the additions to your order on the survey that I will send out towards the end of the campaign. How many ways can I style my garments with Auxilry interchangeable buttons? Is Auxilry sustainable or environmentally friendly? How does the Lifetime Guarantee work? What is a Premium Charter Club (PCC) Member? Can I interchange or reuse the fasteners? Is Auxilry button covers? Can I use Auxilry interchangeable buttons if I am visually impaired? Are Auxilry interchangeable buttons only for men or women? Are Auxilry interchangeable buttons a patented product? Will you create larger sizes for suits and jackets? Will I get to choose the interchangeable button styles and fasteners of my choice? Are the Auxilry fasteners and interchangeable buttons machine washable and dry-cleanable? Can I customize my order and add additional product to my reward tiers? I want to know when my reward is shipping. I am having trouble filling out my survey. I would like to make a change to my pledge. I would like help with preorders. I have a issue with my pledge finances. I have a question for the project creator. I have a question not listed here. I want a refund for my initial campaign pledge. I have a question about BackerKit.